We already have Furness Railway Number 20 - the oldest working standard gauge steam locomotive in Britain. Now we're putting a suitable train behind it! We now have two complete carriages - the most recently completed being the most illustrious we are ever likely to own - it's a coach built specially for the then future Queen of England! What started life as Princess Alexandria's Royal Saloon comes complete with toilet, Guard's compartment and even pantry facilities: it's an entire train in a single vehicle. Because of this Great Eastern Railway Number 5 has possibilities for use on its own for exclusive parties or private hires,as well as being the flagship carriage in our Vintage Train. It is currently at the Beamish Museum in County Durham carrying the first passengers on its newly upgraded standard gauge running line. Just imagine - you could be riding in a former part of the Royal Train! The nine month overhaul is extensively detailed here. 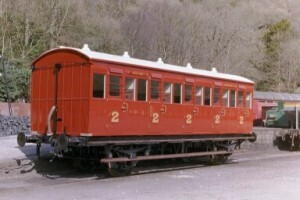 The vehicle has been outshopped for public use in 2010 in its later guise as a special saloon. The first step in our goal was achieved with the restoration of what we thought then (see below!) was an historically-unique carriage body that saw service in what is now Cumbria. The North London Railway Second Class carriage was restored under contract thanks to the Heritage Lottery fund and other backers. It's shown here on the left, after completion. By way of contrast, the picture on the right shows it as it was as a chassis-less body before restoration. You can also read a detailed report on how the team at the Appleby Heritage Centre, supported by Furness Railway Trust volunteers, went about the restoration process. And, with perfect timing, in the same week that the first vehicle was completed, the Trust acquired the second vehicle for this Vintage Train! A sister vehicle to our first carriage, the Furness Railway Trust has been donated a former North London Railway "birdcage" Guards and Luggage van which had been at the bottom of a West Midlands garden for eight decades! (A "birdcage" brake van like this one has a raised portion where the Guard can observe the signals over the roof of the rest of the train.) A massive crane was needed to lift the wooden body out of the private garden, and onto a waiting lorry for the journey to Cumbria. If this wasn't difficult enough, there was a tree in the way, and the body had to be lifted over part of the PC World Shirley superstore that bordered the garden fence! It is now awaiting restoration. A third North London Railway carriage body then came into our possession, and it is another variant on the same design. This time it's the top of the tree, First Class design. It is the same body length as our Second Class carriage, but was divided into four, not five, compartments, to allow more legroom and luxury for those passengers prepared to pay the premium fare. To add to the historical interest, this vehicle was converted during the First World War to be an Ambulance Coach, and still carries the modified doors to one of the central compartments. These can be used to give full disabled access once the coach is restored. And then came the surprise discovery - a second NLR 2nd class carriage body that had been part of a bungalow near Chichester for many decades which was donated to the FRT when the site was cleared. This body still clearly carries its NLR number - 106 - and has been moved to a private site in the Blackpool area pending restoration. So - we hold our hands up, we now know the coach we have already restored is not unique, but we can now claim a unique pair of NLR 2nd class carraiges! Because of its good condition, and the availability of an identical donor underframe to that used with the NLR 2nd class coach already restored, it is likely that this will be the next vehicle to receive attention. Fingers crossed, this next restoration could be the first to be carried in a new FRT workshop building in Preston - as long as progress continues to be made on that critical project! These four former NLR vehicles together will form a fascinating train, able to accommodate well over 100 passengers including wheelchair users. The precise number depends on the final seating arrangements chosen in the First Class carriage with its disabled compartment, and whether any seating is provided in the Birdcage Brake. These can be augmented by the Royal coach to provide further premium accommodation. 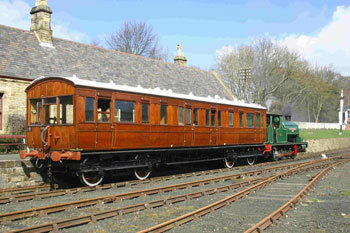 Alternatively, the Royal Coach will be able to be used on its own. It is the Trust's ambition to assemble a full train of Victorian passenger stock to use with Furness Railway Number 20. We are now well on our way towards achieving this, but the vehicles already secured now need to be restored, so there is much work still to do. And we're still on the look out for more vehicles. Away from the vintage passenger train, the FRT owns a number of other passenger and goods vehicles. A 1950s built Mark 1 RMB (buffet car) spent many years at the Lakeside and Haverthwaite Railway, and is now at the Ribble Steam Railway undergoing overhaul. 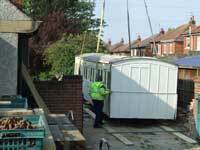 The Trust is now the proud owner of the only surviving FR goods wagon - bogie bolster No. 5999, purchased from the Midland Railway Trust, Butterley. As well as being a key part of the FR's heritage, this is a useful asset - it currently has the cab top and saddle tank from "Cumbria" on board! 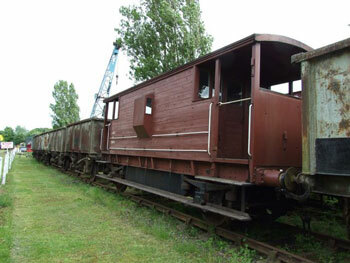 The Trust owns a LMS goods brake van, which saw service for many years on the Permanent Way (track repair) train on the Lakeside and Haverthwaite Railway, before departing in 2009 on a five year loan to the Rutland Railway Museum in the East Midlands. It is seen here marshalled in a rake of wagons at Rutland in summer 2009. In addition, Trust members own a London and North Western Railway "Elephant Van". (The name always causes an eyebrow to be raised! Officially, it is actually a L&NWR "Covered Combination Truck", used to carry anything from parcels, to early motor cars or even circus animals - hence the name!) This vehicle is complete but would need restoration if it was to be used in the Vintage Train. The Trust also owns a more modern CCT which will be used as a donor underframe for one of the North London carriage bodies mentioned above. Both these vehicles are at Preston for storage. Looking further into the future, there are a number of grounded carriage bodies still in existence that hail from the Furness Railway and other Victorian railways, which now find use as chicken sheds and the like. It is possible that one or more of these could be returned to working order.